Colin Kaepernick might lead the NFL’s list of top-selling jerseys, but he is also the most disliked player in the league, according to a recent poll. A recent poll of 1,100 Americans by E-Poll Marketing Research revealed that Kaepernick was “disliked a lot” by 29 percent of those polled, reported ESPN. Tampa Bay Buccaneers quarterback Jameis Winston (22 percent) came in second, followed by Miami Dolphins defensive tackle Ndamukong Suh (21 percent), and New England Patriots quarterback Tom Brady (13 percent), with Pittsburgh Steelers quarterback Ben Roethlisberger (10 percent) rounding out the top five of the most disliked NFL players. The decrease of Kaepernick’s likability paints a different picture from 2014, the last time the poll was taken. Then, he was a starter for the 49ers and led the team to the NFC Championship Game and was only “disliked a lot” by 6 percent of those polled. Kaepernick is currently a second string behind Blaine Gabbert. Kaepernick’s ongoing silent protest against what he terms as racial oppression and police brutality in the United States has likely decreased his likability. Since refusing to stand for the national anthem, Kaepernick has received major backlash, including death threats. “I am not going to stand up to show pride in a flag for a country that oppresses black people and people of color,” Kaepernick said when asked about his stance on Aug. 26. The E-Poll Market Research poll revealed that 37 percent of whites said they disliked Kaepernick “a lot,” in comparison to two years ago, when only 7 percent said they weren’t fond of the athlete. Kaepernick’s protest hasn’t gone unnoticed by the African-American community. 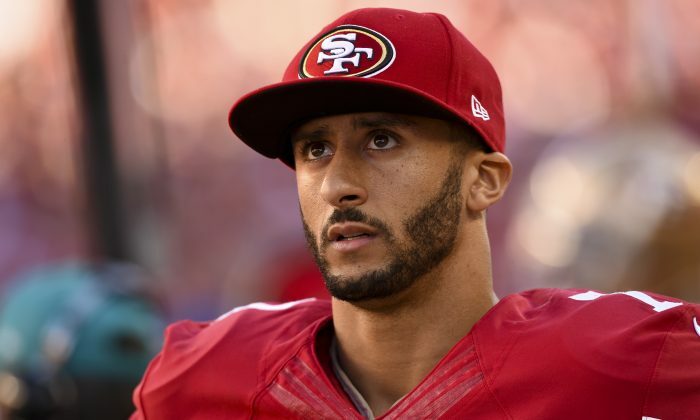 The poll showed 42 percent of African-Americans said they like the quarterback “a lot,” while only 2 percent dislike him “a lot.” In 2014, Kaepernick was only liked “a lot” by 16 percent of African-Americans and disliked “a lot” by 3 percent of blacks. However, Kaepernick’s headline-making stand has increased his exposure. Two years ago, only 24 percent of people were aware of his name, whereas now 42 percent of those polled know about him. The San Francisco 49ers will take on the Seattle Seahawks at CenturyLink Field on Sept. 25.